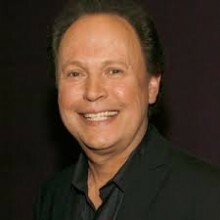 Award-winning actor and comic Billy Crystal was born William Edward Crystal on March 14, 1948, in Long Beach, New York. Billy Crystal has spent much of his life making people laugh. He grew up the youngest of three boys. A born entertainer, Crystal liked to sing, dance, and act with his brothers for family in their living room. “I was the little Jerry Lewis,” he later told the Washington Post. As a child, Crystal met several famous musicians and performers, including Billie Holiday, through his father, Jack Crystal, who acted as a booking agent for jazz acts. His father also ran the Commodore music store and co-founded the Commodore record label with Crystal’s uncle, Milt Gabler. Crystal’s father sometimes brought home comedy albums of performers such as Bill Cosby, and the recordings were early influences on the budding comic. His parents also let him stay up to watch such humorous television personalities as Jack Paar and Sid Caesar. After graduation from college, Crystal worked as a substitute teacher. He also started a comedy group with some friends, but he eventually decided to go it alone as a stand-up comedian. In 1975, Crystal made his first appearance on “The Tonight Show with Johnny Carson.” He appeared to be a young comedian on the rise. Two years later, Crystal took the groundbreaking role of Jodie Dallas on the sitcom “Soap.” He played one of the first openly gay characters on television. Only on the show for one season, Crystal created several memorable characters, such as swanky television host Fernando Lamas. This character’s catchphrase, “You look mahvelous,” became part of popular culture. Crystal also did some spot-on impressions, wowing audiences with his take on Howard Cosell and Sammy Davis, Jr. For his work on the show, he received his first Emmy Award nomination for Outstanding Individual Performance in a Variety or Music Program. Not long after his stint on “Saturday Night Live,” Crystal’s career began to take off. He launched the popular televised comedy fundraiser, “Comedy Relief,” with Whoopi Goldberg and Robin Williams in 1986. The show aired annually for 12 years. In perhaps the biggest role of his career, he starred opposite Meg Ryan in the romantic comedy “When Harry Met Sally…” in 1989, which was a box-office hit. Crystal scored again two years later with “City Slickers.” Around this time, Crystal also established himself as the ultimate award show host. He hosted the Grammy Awards in 1988 and the Academy Awards in 1990. Since then, Crystal has hosted the Academy Awards eight more times, most recently in 2012. Over the years, he won five Emmy Awards for his work on the Academy Awards ceremony. Later in the 1990s, Crystal went to work with director Woody Allen on the comedy “Deconstructing Harry.” He scored another big hit with “Analyze This,” a comedy about a crime boss (Robert De Niro) who seeks help from a therapist played by Crystal. This humorous odd couple reunited for the 2002 sequel, “Analyze That.” Working off-camera, Crystal directed the baseball-centric television movie”61*.” He also voiced one of the lead characters in “Monsters, Inc.” as well as a small part in “Cars.” Crystal additionally branched out in another direction — as a children’s author. He wrote “I Already Know I Love You” shortly after the birth of his first grandchild. In December 2004, Crystal brought his most personal work to the Broadway stage. He wrote and performed “700 Sundays,” the one-man show that took its title from Crystal’s calculations on how much time he got to spend with his father before his death. Filled with family stories and sports references, the show won a Tony Award for special theatrical event in 2005. In 2013 he released his memoir, “Still Foolin’ ‘Em: Where I’ve Been, Where I’m Going, and Where the Hell Are My Keys?” Crystal currently lives in California with his wife, Janice. Do you want to hire Billy Crystal? Directly request a quote. In 48 hours we can send you the availability of Billy Crystal If you would like to book Billy Crystal, Entertainment Booking Agency is the right place. We will offer you the best price and contact the management or we directly contact Billy Crystal. For corporate appearances or speaking engagements you can contact our agents and the will help you true the process. Tags: hire Billy Crystal, Billy Crystal booking, book Billy Crystal, Billy Crystal appearances, find more information on booking Billy Crystal for appearances, Billy Crystal speaking engagements, Billy Crystal endorsements/spokesperson, Billy Crystal appearance fees, Billy Crystal booking agency contact info, biography of Billy Crystal, Contact an artist booking talent agent find a speakers bureau that can book Billy Crystal, speaker booking agency for Billy Crystal, Billy Crystal booking agency, Billy Crystal booking for corporate event. EBA is one of the biggest entertainment booking agencies in the World. We book hundreds of celebrities, artist, athletes and speakers in a year. Important to know is that we are not claiming to be the management of Billy Crystal. We are not the official agent for Billy Crystal. Companies from around the globe book these artists and speakers true our company be course we have one of the biggest networks and we always have direct contact with the artist or the management. We help you to find the right celebrities for your corporate of private events. Please contact one of our agents to get free advice and we will help to get the world-famous artist on your party.